Before we made the commitment to add another pet to our family, there was much research and discussion in regard to what breed would be best. 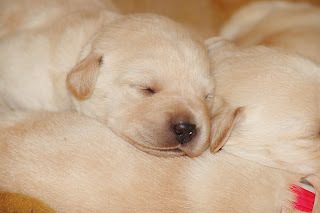 As our new pet would primarily be our son's pal, we were certain that we wanted him to share the experience of raising a pet from the pup stage. My daughter, whose personal pets are cats she's had since they were kittens, wanted a Lhasa Apso. My husband was hoping for a manly breed, like a Shepherd or Rott. In the end, as was only right, my son made the final selection from the 'parental approved' breed list. Predictably, he chose a Lab. With the breed's typically friendly demeanor and high activity level, we approved, looking forward to the inherent exercise and family walks that would be involved. Atypical for a Lab, our boy was not always a fan of the water. You can read more about that here, if you'd like. 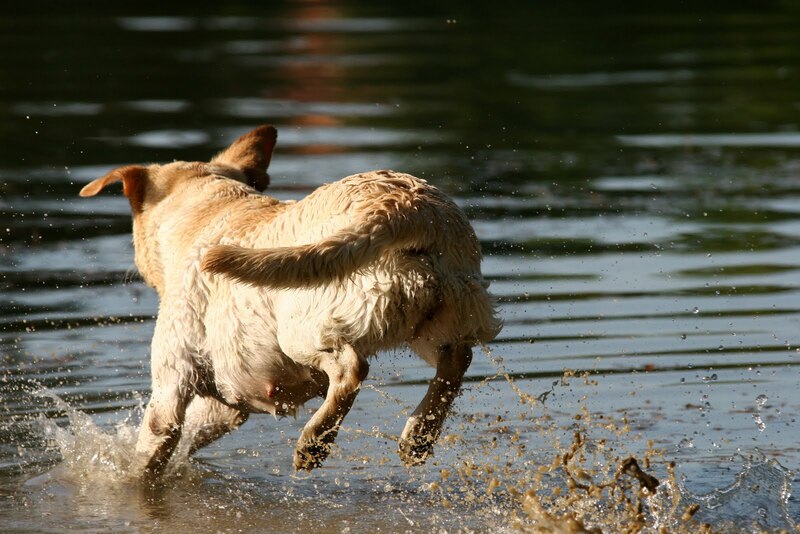 In any case, our favorite place to exercise our boy is at the local "free range" dog park, where he can run and run to his doggy heart's content and swim like the best of them in the dog pond. cleaning him up afterward! Not only after adventures in the dog park, either! If there's dirt, he'll find it. And want to cuddle afterward. I was thrilled, THRILLED, to be given an opportunity to test the Water-LESS Pet Bath Towel, as you might imagine! when a full bath is just not practical. The Water-LESS Pet Bath Towel is a life (and upholstery) saver! Finally.... a way to bathe pets without getting them soaking wet! Just dampen the specially designed premium quality microfiber pet towel then rub down your pet gently and effectively removes oil, dirt, dust, dander and more from your pets. Keep your pets clean , happy and healthy without the use of harsh shampoos and irritating chemical cleaners. Finish by spraying your pet with your pet deodorizer. No Stress....No Mess! Premium quality microfiber designed especially for pets gets into the nooks and crannies of your pet's fur or hair to effectively remove oils, dirt, dust and dander. 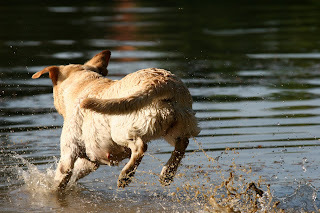 We did not hesitate to put this product to the test on our very next trip to the dog park! True to the claims, it worked like a charm! The microfiber fabric was soft enough to give him a good rub down, but textured enough to really get the job done! 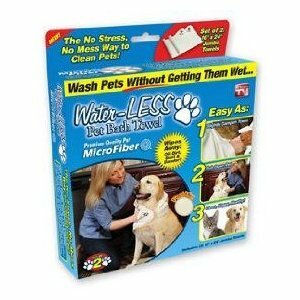 Just wet the towel and wipe them down, without having to then contend with a saturated pooch! At $5.95 for a set of two, it is my opinion that the Water-LESS Pet Bath Towel is a must-have for muck-loving dog parents! You can purchase the Water-LESS Pet Bath Towel at TVTopTen.com for $5.95, as well as view and purchase from the full line of As Seen On TV pet supplies. TVTopTen.com uses 80% recycled materials in shipping their products and adhere to the company's goal of reducing packaging as much as possible to save on packaging waste. Employees even bring packaging supplies from home to help the recycling effort! TVTopTen.com is generously offering That's What She Said readers a chance to win a two-piece set of Water-LESS Pet Bath Towels! Please note: you must follow That's What She Said publicly via Google Friend Connect (mid right sidebar) to be eligible to enter this giveaway! This giveaway is open to residents of the US, ages 18+ and will end on Wednesday, July 6, 2011 at midnight EST. The winner will be selected randomly from all eligible entries and will be notified by email. The winner will have 72 hours to respond before I must move on to a runner up. So that I may contact you if you are the winner, please leave your email address, in anti spam format, in your first entry comment, if it is not available via your comment name. To be eligible to enter this giveaway, you must follow That's What She Said publicly via Google Friend Connect (mid right sidebar). For mandatory entry, please visit TVTopTen.com and tell me a pet product you'd love to try in a comment here. IF YOU ARE ALREADY FOLLOWING, LIKING, ETC, PLEASE TAKE THE ENTRIES! * Like TVTopTen and That's What She Said on Facebook, leave comment here with your facebook name, 1 entry per each. * Follow TVTopTen and That's What She Said (tsue1136) on Twitter, leave comment here with your twitter name, 1 entry per each. * Tweet about this giveaway. Limit of 3 tweets per day. 1 entry per tweet. * Subscribe to TVTopTen RSS feed, leave comment here with applicable name, 1 entry. * Subscribe to That's What She Said via email or RSS feed (mid right sidebar), leave comment here with applicable name, 1 entry per method. * Enter any of my other active giveaways, leave comment here letting me know which, 3 entries per additional giveaway. Stumble, Digg, Technorati, Facebook, Blog, post on giveaway linky, anything goes. Must include direct link back here. 3 entries per each sharing. Please leave a comment with a link to your sharing so I can find it. Handy share button at bottom of post. * Tell me about your pets, what type, how you came to adopt them, a funny story about them, especially of the mucky "you got into what?" variety... 1 entry. Congrats to Chisum Crew, comment #130, courtesy of Random.org! On behalf of TV Top Ten and That's What She Said, thank you to all entrants for following and participating! I was provided with a Water-LESS Pet Bath Towel two piece Set to explore for the purposes of creating this feature. The opinions above are both honest and my own. Images and information sourced from TVTopTen. Sponsor is responsible for supplying and shipping prize. Dog Images. Facebook is not associated with nor responsible for this giveaway in any fashion. I am loving your Pamper Your Pets giveaways. I follow and the Shed Ender is a product I'd love to try for our family pet. I follow on gfc and would love to try the Shed Ender. I love the Shed Ender. I like the Shed Ender. Following via GFC (christie roberts). I'd like to try the Instyler! About my pets: We adopted Daisy, a cocker spaniel-yellow lab-chow mix, at Operation Kindness in Carrollton, TX. She's got a purple-ly tongue and lonnng eyelashes. I love her sooo very much. The Shed Ender looks great! I have 6 animals. I have 3 cats and e dogs. They are all over 7 years old. I got 2 cats Annie and Gabby at the humane society as kittens. Sylvester the 3rd cat was gotten when Grandma died. I have 2 bichons brothers and one golden retriever who was Grandmas also. They are funny to watch interacting. My bichons have cost us a fortune. They are golden dogs. They have had all 4 back legs operated on at 6000 a leg and have metal in them a heriditary thing. The golden lab had a heriditary blindness and can't see. He can still fetch and get around by smell. He is always running into things and the other dogs pick on him so I am supervising like kids. I love them all. The cats jump up on my lap and sometimes make my typing not so good. I could go on and on. Rita Spratlen rj_angel_house@yahoo.com I also have a special seagull that comes to see me to be fed on the deck and hangs out !!!! LOL...love (and unfortunately, can relate to) the 'if there's an unsavory smell, he'll roll in it' bit! WHY?!?! I do follow via GFC, and I would love to try the Sticky Sheets to try to stay on top of the hair control problem we are constantly fighting. I LIKE TV Top Ten on FB! I LIKE That's What She Said on FB! I follow TVTopTen on Twitter as hybroanglid. I follow That's What She Said on Twitter as hybroanglid. I entered the Pet Groom Pro giveaway! I entered the Loving Pets giveaway! I like the Snuggie for dogs... so cute! I also like their "pillow pet!" I'm a GFC follower :) I'd also like to try the Crazy Critters! I follow on GFC, and I'd love to try this as a way to clean my water-wary cats. Yes, even the one who likes to splash water out of the water bowl runs at the word, "bath." Another product we'd love to have from the site is the Emery Cat scratching toy.